Kapar, Selangor – Rumah Kebajikan Rita was filled with joy and laughter recently as all of the 68 children of the home received their new ‘Deepavali baju’ and other goodies to celebrate the upcoming Festival of Lights. 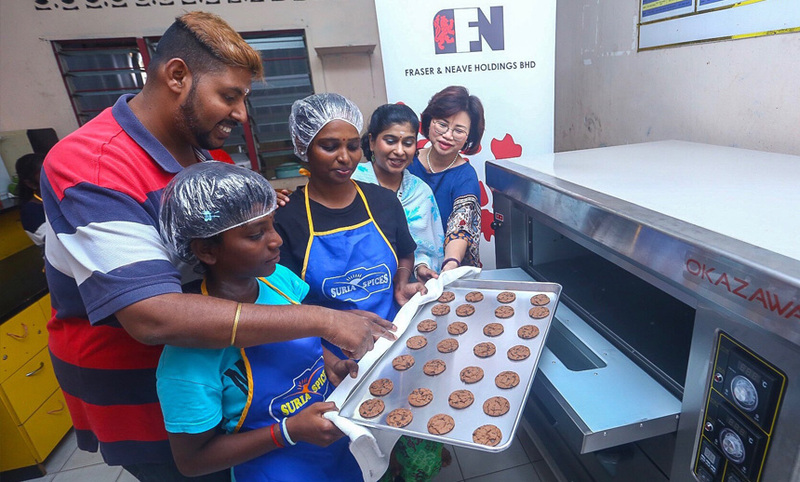 Besides presenting the children with gifts, Fraser & Neave Holdings Bhd (F&NHB) made the festive season brighter by surprising the home with a two tier oven to enable the children to bake cookies and cakes for Deepavali. The contribution will not only encourage the children to put their baking skills to the test but also help generate income for the home at the same time. Rumah Kebajikan Rita, located in Kapar, Klang, provides a home for 152 residents including children as young as eight months, orphans, single mothers and fathers, those with physical or mental disabilities and also senior citizens. The children; mostly abandoned and from underprivileged families, were excited to receive the oven, especially Tamilselui Bala Murugan, 14, and Vignarini Murugan, 12. “I am most excited to use this oven as I can bake my favourite Deepavali delicacies. I can’t wait to bake all sorts of delicacies to share with my friend,” exclaimed Tamilselui who aspires to be a policewoman. The children also expressed their excitement to wear the new clothes for the upcoming festivity, “I want to wear a beautiful blouse during Deepavali so that I can look my best while I go to open houses with all of my friends here,” said Vignarini. “Deepavali is a time for spreading joy and happiness. We are honoured to play a small part in making the residents’ Deepavali extra special this year. To see the bright smiles on their faces as they receive the goodies makes it worthwhile. We have been blessed to help the underprivileged every Deepavali and we are committed to spread the festive joy this year,” said Cariessa Goh, F&NHB Corporate Affairs Manager. She also lauded the home for taking the initiatives to churn their own revenue by printing t-shirts, laundry plastic bags for hotels, making snacks and many more. “We hope that the oven will be able to help them in getting additional income via the cakes and biscuits that they are going to bake. And, we have also supplied them with the needed ingredients, worth RM2,000, to help jump-start the baking business. “We had fun watching the smile on the children’s faces as they saw the end products of their first baking experience with the new oven. We are glad to have helped make this festive season a joyous one for them,” Goh added. Meanwhile, Thanamalar Selvam, 24, a single mother of two, who will spearhead the baking team, said that the children and caretakers have become her family. “Living in a house with 153 other family members is always loud and fun. We are all like family here, I try to help out and take care of the kids and shower them with love. The children here, like Vignarini and Tamilselui are like sisters to my own children as they would play, carry and comfort them while I am busy in the kitchen baking the cakes and biscuits. We may all come from broken families, but together, we are complete,” she said. 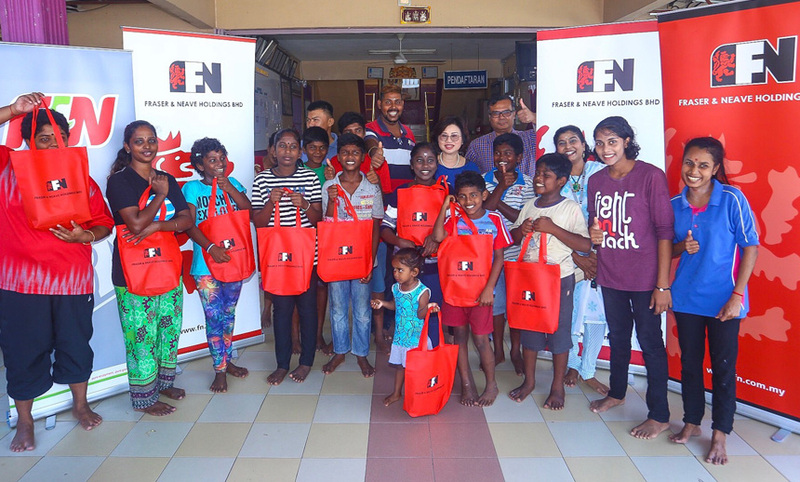 The Home’s Child Welfare Officer, Subramaniam Kuppusamy, expressed his appreciation to F&NHB for the Deepavali goodies as the contribution gave the children something to look forward to this festive season. “We try to give the children their basic needs but once in a while, like all children, they would want to be spoilt especially during Deepavali,” he added. Rumah Kebajikan Rita was established back in 1994. It started off by providing a home for only four people. Now, in 2018, 24 years since its establishment, Rumah Kebajikan Rita is home to 154 residents.